Other speakers included civil liberties attorney Norm Siegel; NYU professor Andrew Ross; Father Luis Barrios; attorney Margaret Ratner Kunstler; the Rev. Stephen Phelps, Senior Minister at Riverside Church; (above) retired Philadelphia police captain Ray Lewis; spokesperson for Revolution Books, Andy Zee; an OWS activist, Aaron Black; and past president of the NYC chapter of the National Lawyers Guild, Danny Meyers. Three musicians from Occupy the Music performed. And Outernational played a set of their revolution rock, ending the rally with "Fighting Song." Some of those with voices of conscience marched in the streets with us in NYC, Chicago, Cleveland, Houston, San Francisco, and Minneapolis. They were joined by core activists in Occupy and hundreds of people who have been inspired by Occupy. 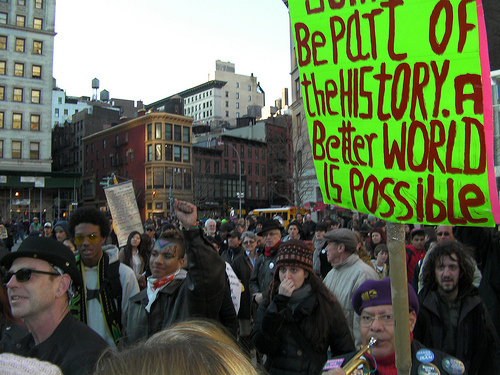 These rallies and marches were an important first step in bringing forward thousands that have been inspired by Occupy into the streets to Stand with Occupy, showing that "people will not tolerate that which is intolerable… that people will not adjust to that which is so manifestly unjust."